Jay was kind enough to interview me for the book, so I’ve had a copy for a while. 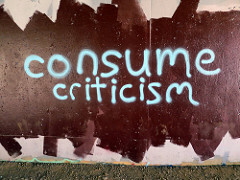 Having spent some time with it, it’s an easy recommendation for anyone in customer service, anyone who deals with criticism of their work and even those of us running social and community sites where people actively post complaints or reviews. 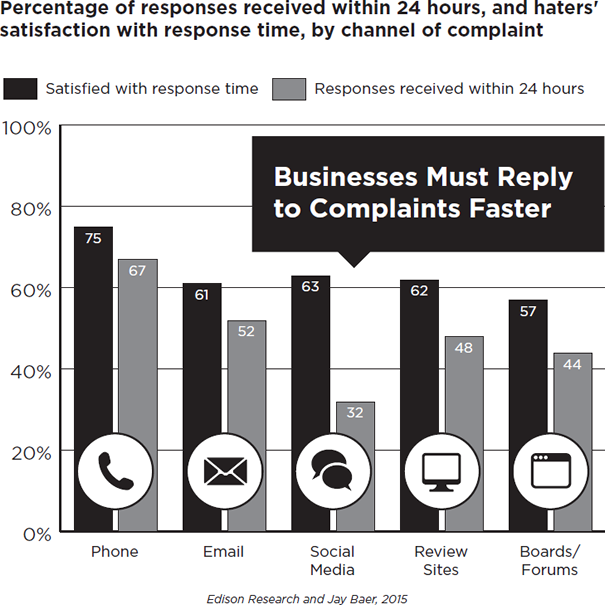 The book makes a compelling case for companies to take the time to engage with people complaining in online communities. 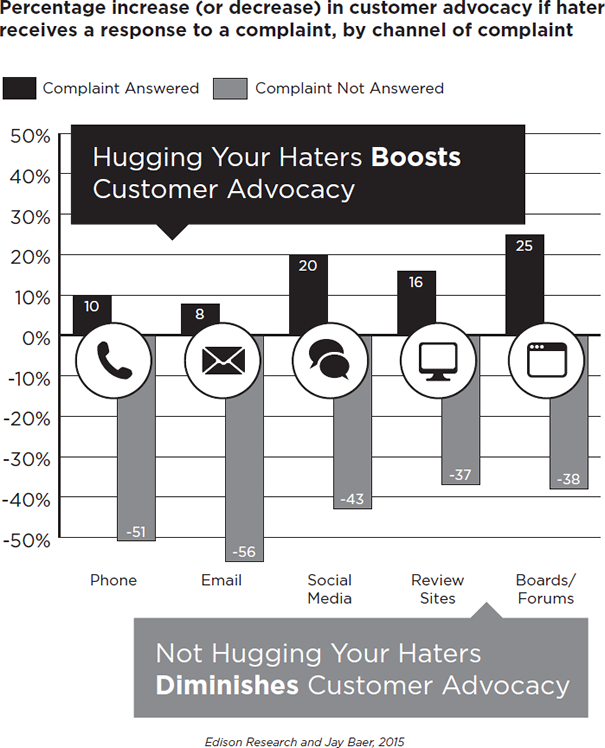 When you respond to a complaint posted in an online forum, on average, you receive a 25% boost in customer advocacy. Compare this to 20% for social media (Facebook, Twitter, Instagram and Google+), 16% for review sites (Yelp, TripAdvisor, Amazon, etc. ), 10% for phone and 8% for email. Much of this comes down to expectation (demonstrated in the next chart). 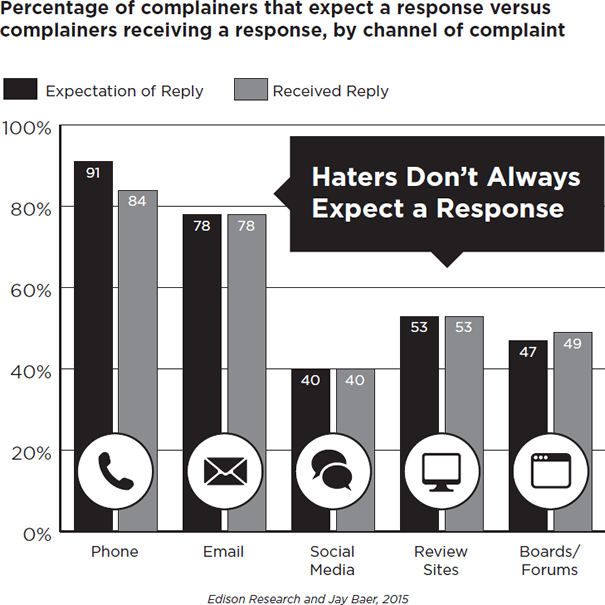 When people complain via phone, 91% expect a response. That’s why, when they fail to receive one, it represents a -51% drop in advocacy. Only 47% expect a response from a forum post. 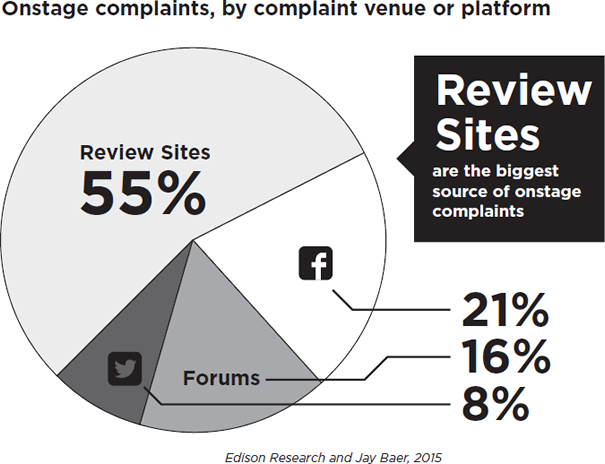 In other words, because others are neglecting forums, there is an opportunity to really exceed customer expectations. “Participation in discussion boards and forums creates more customer advocacy than any other channel of customer service,” Jay concludes in the book. I asked him if there had been any effort to differentiate between official support channels and unofficial ones. For example, an official support forum vs. an enthusiast community or a brand Facebook page vs. the complainer’s profile. They decided against it because, in their sample work, they observed a general lack of awareness of what constituted an official or unofficial channel, so they opted not to apply those definitions, out for concern for skewing their findings. I’m sure some people will look at this graph and say, “there’s no way more people complain in forums than on Twitter,” but this data says otherwise. And it’s plausible. When you consider that Twitter has approximately 66 million active U.S. users, is it not reasonable to believe that all online forums in existence have a number that is greater than that? Review sites exist, by and large, to either praise or complain about something, so it’s no wonder people associate that activity with them so closely. For brands, I believe that part of truly great community strategy is outreach programs to online communities you don’t control. Not just social media platforms where you have your own profile and people have to opt-in to you, but shared community spaces where your customers are talking. This isn’t easy; it’s hard, because you can’t just show up and talk about your products. You are just another participant, and you have to earn respect like everyone else. By participating in good faith, helping people and learning. This type of outreach program can be a tough sell, because there usually isn’t some superficial follower or like count that you can trend over time. There are metrics you can track (views of your contributions, direct referrals, mentions on the community, sentiment, etc. ), but the foundation is an underlying belief that talking to people in their space has value. But data like this could make the pitch just a little easier. Jay’s book is well-worth your time. You can pre-order it directly from him for some extra bonuses. “Managing Online Forums”: Not Just For Forums!